This study is an introduction to the problems of moral philosophy designed particularly for students of theology and religious studies. 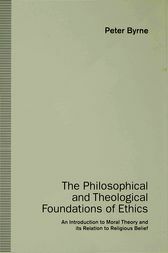 It offers an account of the nature and subject matter of moral reasoning and of the major types of moral theory current in contemporary moral philosophy. The account aims to bring out the major issues in moral theory, to present a clear, non-technical articulation of the structure of moral knowledge and to explore the relation between religious belief and morality.